Prince William Visits Hereford Cathedral today, hence the large police presence in the city. THE Duke of Cambridge met SAS soldiers and veterans at a ceremony to dedicate a Â£1 million memorial to their regiment inside Hereford Cathedral today. Good to see the Prince in Hereford today, made our day when he came over and said hello. 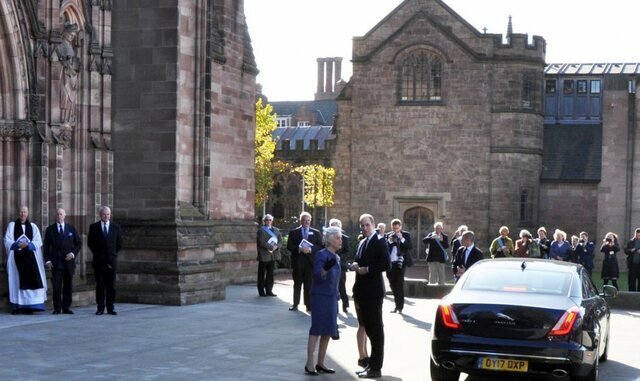 I got there just as he came out of the cathedral, really nice to see our future King in Hereford. It was really lovely, the weather was perfect and Prince William came over and had a chat with lots of people. I was very close to him. A perfect gentlemen.